A Forerunner fort in Etran Harborage. Forerunner forts are Forerunner outposts guarded by large beam turrets and Sentinels. The structure is composed of a delta-shaped structure with a cleave down the approximate center, resembling the beam emitters on Installation 04. It is also surrounded by hard light walls with ends meeting at the turrets. When sustaining enough damage, the structure retracts in on itself and into the ground. 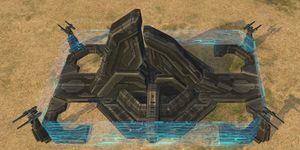 In Halo Wars, Forerunner forts occupy base build sites on Skirmish maps that take place within Etran Harborage, namely Repository, Labyrinth, and Blood River. Like Rebel Bases, these forts serve as the Forerunner counterpart to the UNSC firebase and the Covenant citadel. Defended by Aggressor Sentinels, the fort itself is relatively weaker than the UNSC and Covenant bases, especially vulnerable to Cyclopes and Locusts. However, unlike other bases, the turrets are considered part of the fort itself and cannot be targeted by units, forcing attackers to destroy the fort while under turret fire. Consequently, players may require a larger force to attack a fort. When destroyed, the fort cannot be rebuild, but rewards the player with supply crates and an empty base build site. A fort without its hardlight shields. Renders of the defensive turrets.